Walter Jefferies is looking for more funds to complete construction on his butcher shop; he's put a bunch of his own cash into it, borrowed a bunch, and is looking for more funding via kickstarter. I'd like to see him succeed. When you expand a business is a perilous time -- you have expenses, disruption of your existing business, and unforseen costs to contend with, as well as the normal business issues. If you'd like to support Walter in his project, you'll find it here. Disclosure: I'm going to contribute $100 to this project. As my friend Sabra reminds me, not all government programs are bad. Many projects are well intentioned, and many do good things. We see a whole bunch of press about how government is impacting farms in a negative way, and this is an example of a positive impact. Small farmers all over the country have a problem when they produce animals. They can only sell direct to the consumer, and only has whole or half animals. To allow the farmer to sell individual cuts of meat, or to restaurants or catering companies, you have to have your animals slaughtered and processed under government inspection, either federal inspection, under the USDA, or in the case of Vermont, under state inspection. The problem that they had in Vermont is that most of the slaughter facilities that processed chickens did so as part of a larger business -- they didn't process anyone Else's birds, and the number of businesses that the small farmer could choose from was shrinking. So even if you wanted to take the time and expense to have your birds slaughtered under inspection there wasn't anyone to do it. So the Vermont state legislature decided to help that by funding the construction of a mobile slaughter trailer; they initially budgeted $80k, and due to various changes in design and equipment ended up with a final cost of $93k. .
One fellow stepped up. George Eisenhardt agreed to operate it. Financially the trailer was offered on a 10 year lease, with the lease payments going back to the state to repay the cost of construction. At the end of the lease the goal was to have the leasee own the trailer outright -- basically an interest-free loan from the state to the operator. The payments were $775/month. The State of Vermont didn't want to own the trailer, they wanted someone else to own and operate it, as both operating and regulating the trailer is a conflict of interest for the state. Operation of the trailer wasn't trouble-free; there were some changes that had to be made in the design, drainage didn't work right, so there were pools of water. The trailer could have been insulated better for use in the cold winter months, and the state forgave part of the lease payments so that the needed changes could be made. The basic operation of the trailer was to kill, pluck, gut and chill the birds of individual processors. Each farmer was required to take and store those birds at their farm or business after the slaughter. 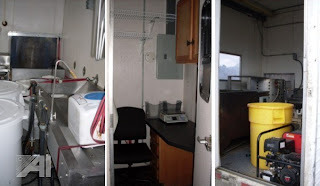 To make sure that it complied with health code, the farm where the trailer was located needed to have their water tested to make sure it passed, and that were was some way to dispose of the waste water on the farm. The trailer was allowed to kill birds from other farms during any particular stop, as long as 51% or more of the birds being processed were from the farm location. Over time several farms would pool their birds and bring them all to the trailers current location and the processing would happen there. If you were killing less than 51% you had to have an approved septic system and other engineered amenities (per State of Vermont law), and most small farms didn't want to bear that cost; so the 51% rule was observed. The trailer would arrive, the hosting farm would bring their birds out, other farms would bring theirs out, and the processing was done under the State of Vermont inspection. The state would send an inspector out to the location, and the inspector would be there for an 8 hour day. The trailer operator, George in this case, could elect to keep the inspector longer, provided he paid the overtime for the state inspector, at $62/hour. The average cost for an hour of inspectors time is $32, plus $0.51/mile travel, to and from the inspectors office, sometimes more than 50 miles away. So on one of these processing days, the state would pay an average of $275 a day to the inspector to be present. The trailer operator and farmers didn't pay anything as long as they held it to an 8 hour day. In the first year of operation, George processed 4,000 birds. In the second year it was 10,000 birds, and in the final year of operation it was 14,000 birds. Most of the increase was by the original farms growing more birds; most of the farms involved increased their bird production, some of them by as much as 400%. Farmers are a cautious lot, and conservative; from these results I think that they're finding their market expanded and having more success. The yearly lease was $9300, and fuel and labor costs are unknown to me, but I'd guess that in year 3 the operator probably cleared (NNN) $15,000. The problem that the operator had was that the locations for processing were long drives; and towards the end of this he'd be criss crossing the state to get from one to the other; driving and setup time wasn't compensated; so he's doing a lot of birds, but eventually decided to move on. One way to reduce that would be to have 4 or 5 docking stations with approved water and facilities and concentrate more of the processing there; this is complicated by the 51% rule I wrote about above, but it would reduce the travel somewhat. Another method would be to have routes around the state so that you only move the trailer the shortest distance you can on any given day. Even with these sort of improvements, to provide a living wage for the operator I think you'll need to raise the price of processing to $6, which would net the operator $43,000 -- a decent wage, and enough to keep them doing it next year. Competitive with other industries. 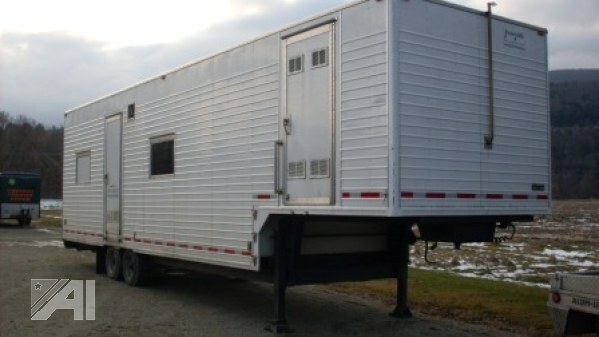 The state of Vermont auctioned the trailer in January of 2012, getting a final bid of $61k for it. The auction occurred after the poultry season had concluded for the winter, and it's not clear whether the new owners, tangletown farm, is going to be processing birds for any other farmers. Several of the farms that were using this trailer expressed an interest in purchasing it, but were not interested in processing birds for other farms in the area, seeing them as competitors. Its interesting that the final sale price + the lease proceeds ended up being pretty darn close to the expense for the trailer in the first place. Unlike some projects, the state didn't lose its shirt on this project. Tim and Liz Young have a lot to say about farming; they've blogged, they've done interviews,and they're now running a farming forum called farm-dreams. This is a review of the book that they wrote about their farming experiences. Tim is the author of the book, and I'll talk about what is said as if Tim said it, but Liz has some part of the farm and is involved in the day-to-day operations; not ignoring her, just working with the book as written. Hi, Liz! This book is self-published, which is perhaps the easiest way to get published. You really don't have to have anyone proofread or edit it, or write about something that a publisher would consider interesting to a wide audience, and this book shows some of that. A good editor is always a good investment. Chapter 9 is a bit of a slog for that reason. Tim had a prettty typical midlife crisis; of confidence, of desire, of goals. Riding horses one day at a resort, he decided to become a farmer, and set about purchasing land. Tim concludes from these struggles that it's the pigs fault -- that they have no mothering skills or instincts, and eventually gets rid of everything but a feral breed of pigs, step 5. Ossabaw pigs, a feral breed, being the next Good Idea that he's promoting. If the goal was to raise animals that could live in the wild, why start with chickens and pigs? Deer do just fine on their own. Tim does this over and over again with different breeds of livestock. He lets his sheep die of parasitic infection, watching them waste away despite having an easy cure available. He allows hundreds of laying hens to get sick, and so many die that he has to use his tractor to pick up the bodies; when a simple vaccination may have solved his entire problem, and throughout this he talks about the evils of factory farming, and how the instincts have been bred out of the animals - and having had hands-on experience with the animals he's talking about, I just don't agree. I have a big problem with the basic philosophy of letting everything die when there are cures readily available. When you're a new farmer, as Tim is, you're going to make mistakes and lose animals. I have no problem with that; we all hate it, but it's part of the process; what I object to is the overall feeling that he's trying to fit a square peg in a round hole: He makes an assumption about livestock, it turns out wrong, and he doesn't learn anything from it and hundreds of animals suffer needlessly. All of the animals he tried are raised all over the country by thousands of farmers successfully.
" Also, the ideology involved in wanting their animals to live completely "natural" lives doesn't jive with the fact that livestock are not wild animals. The point to which they expected their animals to live with minimal support on depleted soil scares me a little, and I wonder if these chapters will end up as fodder for the animal rights movement and conventional ag to argue that pasture-based agriculture is not a viable solution." Tim talks about his experience in corporate america, and his marketing background. That's a field where it actually makes quite a bit of sense to cut your losses and move on if things don't work out, but my experience of farming is that it's slower, more deliberate, and not at all intuitive. Not accidental in the slightest. With any venture it takes time and effort to become proficient at it. What Tim does over and over again is set himself up for farming failure. With the pigs/chickens/rabbits/sheep/beef/bees, he doesn't stick with it long enough to know what it looks like to succeed at it, and at this point he's not raising any commercial quantities of many of the animals he describes in his book; beef cattle, laying hens, rabbits, large black and berkshire pigs, bees and sheep. None of those products are for sale from Natures Harmony now. Tim talks about Joel Salatin in this book. The difference between them is that Joel is still in business, still producing food, and still using the methods he promotes. Natures harmony isn't doing the majority of what Tim describes in the book, and he never talks about the reasons he stopped doing any of it. In my opinion, sustainable means you're still in business, and by that measure, Natures Harmony as described in this book is unsustainable. Tim, you could make this book much more interesting if you included a few pages on the end of each one of your farming attempts (sheep, bees, beef, etc etc) that talks about why you don't do that any more. As it is, the reader is left with the impression that he's still out there doing this, when in fact, the interns have been dismissed, the equipment sold or given away, and the farm train has left the station. As a book that would like to influence farmers, I'd find it much more credible as a "sustainable" farm if it had lasted more than a year or two. Would I recommend this book to a new farmer? No. I wouldn't because it doesn't have any way to overcome the hardships that are talked about here. I'd rather that they started with a more balanced book that talks about problems and solutions, perhaps one that is based on a farm that has figured out and overcome the typical problems and has found a way to make a profit. Tim does spend a bit of time in this book talking about making a profit; in fact, chapter 10 is mostly about Tims view of farm economics and making a profitable farm. With this much animal death and destruction, purchase and then disposal of equipment and the huge sums of money spent on the custom house, swimming pool and acreage (and 14,000 feet of woven wire fence and 8,000 feet of water lines installed), in my opinion I can't see Tims farm as having pulled a profit at any time by any reasonable measure. * While Tim does like to broadcast his views, he takes a dim view of anyone who has any view that is in any way contrary to his. He's banned me from his site, his blog, farm-dreams and any other venue where he has editorial control. Tim is strictly broadcast-only with his view on farming. It's not a dialog. I was doing the daily chores and noticed that a piglet was away from the sow; and a quick check showed that of the 11 piglets she had, the little guy I'd noticed and 3 others were missing. When piglets are small they can fit through the biggest openings in a hog panel, but usually can't get there because they can't climb up that far up the panel. The sow had pushed the hay around and formed a ramp, and for some reason four piglets had decided to go out. I fixed that, and then went to search. It's unfortunate for the pigs if they're away from the sow, especially in the cold and wet of spring. I found one pretty quickly; cold and dead. And then found another, also dead. At this time of year, if they're not with the sow and get wet at all hypothermia kills them quickly. I didn't have much hope for the third, but working my way around the sow in a circle, I found this little guy behind a barrel of feed. He had wedged himself in so that he couldn't fall over onto the cold concrete, and had saved his life in doing so. When I found him he was barely responsive. No vocals, and very limited movement. He was ice cold. I ran him over to the truck, and had a spare pair of jeans that I used to wipe off the mud and water and get him dry, and then searched the truck and found the towel. I turned the truck on, and used the floor heater to get some heat on him. He wasn't making any coordinated motions; he wasn't oriented at all. I shut the gate and took him to the house, and filled the bathroom sink with water. Hypothermia is a core body temperature that is too low; depending on how cold the animal got, the blood in the extremities may clot. I used a thermometer to make sure that the water was 103 degrees, and put the piglet into the water, holding his mouth and nose above the water. a little reaction as he went into the cold water, but not much. Not very hopeful but I kept on. Water is the most effective way to get heat into the core of the animal; I gentle moved the pig in the water, and watched the temperature. When it went down to 99, I ran warmer water in and brought the temperature up to 103. I'm starting to see some movement now, paddling motions that remind me more of dreaming than anything. Pulling the pig out of the water, I towel it down, and let it rest in the output from a wall heater for a few minutes. I just don't see any improvements after 5 minutes, so back into the water this little pig goes. This time is a little different -- I can feel the pig relax as the warm water covers it. The eyes, that have been partially open, close, and the breathing seems to be more regular. Poor little guy. moving it up and down, the piglet feels warm now, and seems to be dozing or sleeping. Toweling him down, back in front of the heater and wait. He looks like he's sleeping. I let him be for 15 minutes, and then wrapped in the towel I drive back to the farm and put the pig back with the litter. While I'm driving I'm seeing him snuggle into the towel; good. Coordinated movement is a big improvement. Back with the other piglets, he's clearly exhausted and probably dehydrated. I watch for a few minutes, he seems ok, so off to do the rest of the chores. About an hour later I check on the little pig. Still lying in the same position... I think he need something in his stomach. Some rehydration mix and a big syringe and the pig has a full stomach. 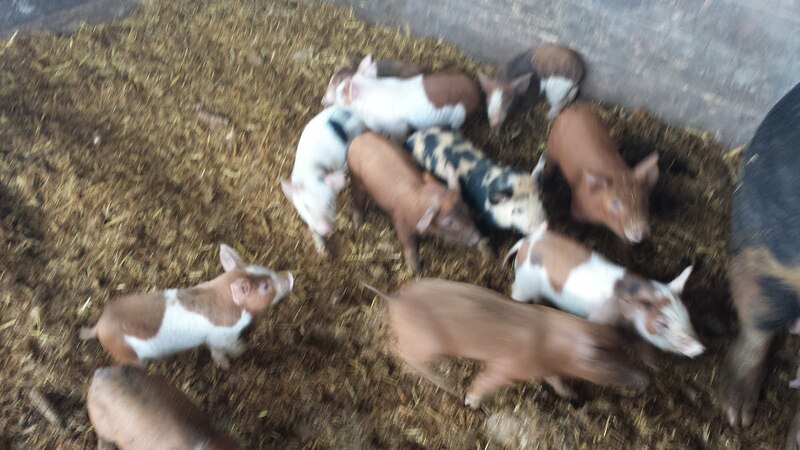 Back with the piglets, and this time he crawls into the pigpile and seems better. looking good. 2 hours later, on a final check for the day, he's suckling with the other pigs. He might make it. Fingers crossed. Got to the farm a little early today and both of the adult eagles were perched in a tree across the road from my front gate. They're becoming a regular site. Too regular. Much too regular. The trough and feeding area turned out pretty well. I'll install the feeder gate and trough and automatic waterer tomorrow. It sure does look good when its done, but it sure is a lot of work to get there. after a week of prep early on the day we'll be pouring we double check the forms to make sure that they're graded appropriately. I want water to drain off the slab, so 2" drop on an 10' run is what we've done. The concrete truck has a tight fit between the fence and the forms and in fact hits one of the forms. A little rework and we're good to go. The chute allowed us to put the concrete up to 15' from the back of the truck, which meant we didn't need to rent a line pump for this job. The work was done in stages, with the "finished" line moving slowly up the driveway. Then bull floated to smooth it down. Expansion joints cut every 8 feet, and then a broom over the surface to give it some traction, and it's done. Later today it'll be hard enough for people to walk on, about a week from now it'll be equipment-ready. 20 man-hours of work on the pour day. We'll all sleep well tonight. I started my farm blog after I'd had my first run-ins with the pack of regulatory agencies that I have to deal with. My reasoning was to provide a forum where I could talk about farming, and my farm, and shine some light on the process of bring food to peoples plates. Over the years I've looked at what people read, and what they comment on, and what they refer to -- either on blogs they write, or social media, or email links to friends. What people seem to like in my blog is honesty and the nitty gritty. Like the luckiest chicken in the world (who's still alive and kicking, by the way) or my chicken eating dog (hard to sell anything when your dog is eating your product. ) or when I challenge some other farmer to actually raise pigs per his written claims. What I didn't expect is that I'd get offers to write a book every 3 months for the past three years. Books on farming particulars - slaughter and meat cutting - homesteading - husbandry ... variety of topics. It's a bit flattering, but I have had to turn the offers down due to lack of time. ...although the last offer with a $10,000 advance, was pretty tempting. As an off-farm income stream, books are a pretty good thing. They don't require any of your time, royalties continue after you're done, and after a while, you can have several of them. My offers were from publishers, but just about anyone can have their own book published on any subject for a few thousand dollars. 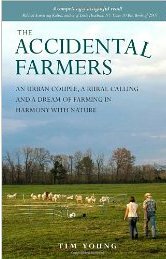 That's what Tim and Liz over at Naturesharmony/farm-dreams did with their book. One of the main advantages I've found on the regulatory front is that none of the government officials like the idea of being in my blog. They hate being photographed. They hate having their names here, and they really REALLY hate it when I talk about what they do. Like the time I found a county employee writing complaints about me and then enforcing her own complaints. That was fun. It doesn't mean I'm friends with them, but for the most part they came into my life in an adversarial way, and it's been very useful to be able to poke fun at them in a way that they care about. When an agency writes you a ticket/complaint/notice and order/compliance order they have some sort of process that they want you to jump into, and to be blunt, that process is so expensive and time consuming to navigate that the vast majority of people they interact with just give up and do whatever they want them to do, no matter how ridiculous. It doesn't cost the agency much to put you through the grinder, and my blog has been a useful grinder of my own. Sunshine, light and air. Lets see what folks think of what you're doing. And that's been a benefit that continues today. Being able to focus some sunlight on the officials has actually made my life a little better. For the most part, they'd rather chase someone who doesn't have a blog, which actually suits me just fine, thank you. I've been regulated plenty. I don't take advertisements or endorsements on my farm (at least not intentionally; there may be a link here or there that promotes something, but I don't get paid for any of them), and that could be a benefit, but I'm ok with being ad-free for right now. It just doesn't seem worth the bother for the $50 a month, but I guess that could be a benefit, too. I'm also able to talk to and meet other folks who are interested in the same sort of venture that I am. 6 years of full-time farming and I'm able to say that I enjoy it as much now as I did. The challenges are different as the farm matures, and I think I should write about that. So I guess I will. When I purchased this property it had basically nothing on it; no water lines, no fences. No buildings. No corral. No gravel. And I've been walking up and down this driveway every day for those 6 years, and, well, I'm tired of mud. Really Really tired of mud. So I finally bit the bullet and decided to pave the driveway. It's a little more complicated than it might be, as I have to keep the driveway usable, so I'll pave half of it at a time, and use the other half while the concrete cures. I'm also building in a feeding area for the cows, with a water faucet and a drain and a feeder panel. Cattle feeder panels allow the cow to stick its head through to eat, and helps the cows stop fighting each other over the hay, and because they can't lay in or trample the hay, it means more hay goes into the cow and less into the dirt. It's big enough for a round bale to be put in, or several small squares, or a feeding trough, depending on what is on the cows menu, and on the left side there's a concrete platform for a water trough. My goal here is that the cows will be standing on a solid platform that is easy to clean when they're eating. The area around troughs usually gets really muddy. Since I'm getting all formal, I made a formal water shutoff valve for the front of my property. This involved digging up the water line, installing a shutoff valve, and then making a riser to bring the shutoff valve up close to the surface. It's completed by a concrete meter riser (that box you see in the center of the picture above, that's vehicle-rated. I put this box in the driveway so that it's easy to find. Even though it's vehicle rated I'm a little skeptical that it will hold up, but I guess I'll see. The driveway itself has a layer of 2" rock, compacted, and then a layer of 5/8" minus (crushed rock), compacted, and then 4 gauge welded wire mesh held up by dobes (I don't know how to spell it, it's pronounced as in "adobe"), which are small concrete blocks with wires sticking out of them. The purpose of this is to hold the mesh up off the bottom of the pour so that it gets more centered in the slab. This is the main driveway for the farm, and we have heavy trucks and equipment moving up and down it every day; so the driveway itself is 6" thick, and I'll order the concrete with fibre reinforcement as well. With the mesh and the prep and the fibre, this will be a very stable surface. Eventually we'll go 20' wide by 200' long. It's a bigger area than I need strictly as a driveway. It'll be used to stack and store hay on, repair equipment, and everything else that requires a stable, level surface. It will also provide a staging area in the event that the island floods in the future, too. I'll need to get trailers in and out quickly if that happens, and having the driveway paved will make that easier. I don't write much about the sheep becaue they really don't take up too much of my time. They're pretty low care overall. Once every six months or so I trim their hooves, and I feed them hay in the winter, and put out minerals for them, but that's about it. For the most part they keep the grass clipped and feed themselves for the majority of the year, which is really very nice. That's part of the reason I picked the katahdin breed of sheep -- they shed their wool every year, and so do not require shearing. Today I spent part of the day tagging and inspecting the lambs; the female lambs get tagged, the boys get counted; I have a customer base that prefers young intact rams for their holiday festivals, and so I'm usually able to sell them at a premium over the usual sale price. I take notes on the female lambs, weight, coat condition, overall conformation, and I'll go back in a couple of months and look at them again. We have 38 lambs this year, 21 females and 17 males, from our flock of 26 ewes, which ended up being a 140% lamb production, which for serious sheep people like Michelle is low, but I'm pretty happy with it. The holy grail of sheep apparently is a flock that requires little or no input, and gives you an average of 2 lambs per ewe per year, in the form of twins. The grass is growing in the fields right now, but I'd like it to be 6-8" high before I set the sheep out on it. We're feeding these 64 sheep one round bale of hay per week. I'll probably be putting them out on pasture in another 3 weeks or so. The ear tags are the only way that we can reliably tell the sheep apart; at this point there are 5 people working on the farm, and when we need to do something with a particular animal, it's nice to say "get sheep #30 and bring it to the front". The boys don't get tagged, which is the other conversation we have regularly -- which animals can be sold. We only tag the animals that we may be keeping. The wild ducks that I wish that the eagles would eat instead. These ducks are on the ground about 50' from the two adult eagles. The eagles stare at them for hours. I would not be a happy duck with that sort of attention. I think that the bald eagles in my area prefer ducks. I think that duck is tasty, too. I've got a mated pair that has nested in the woods behind my pasture, and they've managed to hatch and raise two youngsters. Unfortunately for me, they're teaching their young that domestic fowl are tasty. So far they've killed 4 guinea fowl, 1 goose, five ducks and a turkey. I'm concerned that these eagles are being habituated to taking livestock, and I'm not sure what to do about this. They're daytime predators; this duck was killed at 11am in the morning. What they're forcing me to do is closely pen my poultry, and now I'm wondering when it will be safe to put lambs out, or even sows with piglets. I've built a number of fences over the past 5 years, and I'm building another one now. The conventional wisdom on fencing is that you can't built it too well, and I've found that to be true. It's also said that you can't have too many gates, or gates that are too wide, and that's true in my experience. You see, I have these huge steers. They're going to be slaughtered this year, but as far as the animals on my farm, they're the giants. They're over 5 feet tall at the shoulder, and weigh around 1200lbs (that's a guess, may very well be more), and they are TOUGH on fencing. They basically walk through field fencing, and step gingerly over hog panels. They don't like the electric fence, but if they're startled they can run right through it. And cows startle sometimes. For reasons only known to cows. I'm also going to be getting more cattle this year, and I needed a pen that I could put relatively wild cattle into that was secure for everyone involved. With a secure exterior fence I can then put up an electric fence inside it and condition the cattle to it, with the eventual goal of having the cows out on pasture with only the electric fence. But they have to learn to respect the electric fence... and so this is the pen that is attached to my corral/loading chute complex. The posts are pressure-treated 6x6 posts, buried 36" deep and set in concrete. They are set 8' apart, and the rails are standard 8' lengths of 2x6 painted with preservative. I am careful to set the posts 8' apart because it makes repair of the corral very easy. A board gets broken? Just knock out the ends, buy a replacement 2x6 for $3 and in 10 minutes you're done. They are nailed to the posts with 4 3" nails and an additional 6" spike, two spikes per board. The nails are not enough to keep the board on the posts if you have a cow bounce off the boards; the flex of the impact is enough to pull standard nails. Lag screws are a better way to go, but they are too pricy. 6" spikes are about a nickel each, and for the extra 10 cents, well worth the investment. They also make it harder to knock the boards off from the "wrong" side. Notice that the boards are nailed on the inside of the fence. If you smack the corral from this side, the spikes keep the board on the posts. Since I'm building stuff, I also put a feeding station into this fenceline; you can see the feeder panel (that green pipe thing on the right side of the photo, laying on the ground). That's so that the cattle can be fed from outside the corral, for safety and efficiency purposes. I'll put a small concrete slab underneath the feeding area, which also contains a faucet and trough, so that the cattle aren't standing in mud when they're eating. The area around feeding stations and troughs is usually very muddy and I'd like to keep it cleaner from now on. This area is a dual-purpose. In the non-growing seasons its where the cattle will be kept; close to the front of the property, easy to feed, with an all-weather road and access. It's next to the chute for easy loading in case of flood or other need -- like sales -- and it's big enough that it can be maintained with the big tractor. In the growing seasons, late spring to early fall around here, I'll have it planted with vegetables. When the cattle return they can glean any leftover plants/vegetables as their first task. I have found it to be very comforting to be able to put an animal into a secure enclosure and know that it's safe and sound until morning; lets me sleep better. * Don't saddle yourself with a huge mortgage for your cow acreage; suggests strategies for finding low or no cost land that I find pretty credible. I've arranged to use 17 acres of grass for the next 3 years in return for a side of beef; I used a strategy similar to those described here to get that deal done. * Don't fall in love with equipment; spend as little as you can on the machinery, and as much as you can on the things that make you money -- like more cattle. * Take advantage of seasonal variations in price by picking a type of cattle buyer and timing your production to the peak price. Example: Sell to people who want summer grazers. Calve in the fall and sell the weanlings in the spring, when the demand is high for summer grazing stock. Practical, useful advice and a reminder that producing a farm product is only have the battle. You have to sell it, too. Each market that you might sell to is discussed. It does include chapters on grazing plans and waterers and design for mineral feeders and so on, but I think that the discussions of marketing your cattle are the best part -- if you've never look at having cows, it talks about the way that prices will go from year to year, and when you can get a better price for the same animal. Recommended reading if you're into cattle. "Odd bits", by Jennifer McLagan. This book is a collection of recipes and strategies for cooking all the parts of the animal that are difficult to cook, or unfamiliar to most people. Pigs feet and marrow bones and all of the things that most farmers are left with after they sell the animal. Feet, tails, shanks, lungs, heart, liver, bones, necks -- all are covered, and for beef, pork and lamb. No matter what you're slaughtering you'll find recipes in here for that. I have a sincere interest in using as much of each animal as I can; and things like marrow bones are *really* tasty. So if you're interested in using a higher percentage of your animal, or perhaps just in getting more food value out of your slaughter, this is a book that I'd recommend. "Preserving food" by Deborah Madison is on my list because I'm interested in finding ways to keep food in a shelf-stable way. This one covers a variety of methods to preserve your food and your freezer space, too. For those folks who are interested in the long-term storage of food that doesn't require electricity, this book is very useful. It'll give you a brief treatise on food safety, and then take you on a nuts-and-bolts guide through various preservation methods that result in tasty food that will keep for years. One of the most amazing thing to me about ancient cultures is that many of them devised very accurate calendars, which to most modern people wouldn't seem like a very important thing, but in ancient times, and more recent ones too, the calendar is a very important tool. The Mayan calendar broke the year up into 20 "months" of 13 days each, leaving a 5 day unlucky period that they named Uayeb* in each year. They had a very good understanding of the night sky and the celestial mechanics, and their predictions of solar and lunar eclipses is accurate to this day. They'd even calculated the exact length of the year, down to a thousandth of a decimal point -- far more precisely than other civilizations of their day had. I don't really wonder why they started keeping an accurate calendar, for me, the answer is simple: Crops. Or in the case of the Maya, it was probably Corn. When you're going to plant your seeds, you want to do so at the best time for the seed, and with enough time to allow for the eventual harvest; plant too late and your plants won't mature by the time that the season ends. Plant too soon and you run the risk of poor germination, loss of the plants due to weather (cold, rain, frost) or less-than-ideal conditions for growth. At this time of year every farm is looking at the sky, and the ground, and their plans for the year, and at a calendar. For me, I rely on my past experience, which says that I need to start my tomato and basil plants indoors on the 2nd week of March, which will give them enough time to be good size when the weather is right for transplanting into the greenhouse. So I'm carefully preparing potting soil and trays and making sure that the heat mats work and that the grow bulbs work after a year of non-use. I'm looking carefully at the maturation rates of the vegetables that I'm going to plant this year, and I'm using a paper calendar to write down when I need to start things, and when I need to transplant things. I do this because I'll never remember all of the details, but with a schedule on a calendar, I only have to look at the day and see what I need to do. My own personal calendar, but far less precise than the Mayans. I'm using some tools that the ancients never had; I use a soil test to make sure that my soil has the appropriate mix of stuff; I usually have to add ground limestone to "sweeten" it. I have never had to add organic material because I've already added it; the composted manure and fruits and vegetables and wood chips and bedding provide a beautiful soil on which to grow things. I use a hoophouse, which allows me to stretch my growing seasons a little on each end; I could, as some do, heat the hoophouse, and provide electric lights and grow all year, but I prefer the seasonality and my hoophouse has other uses during the off season. 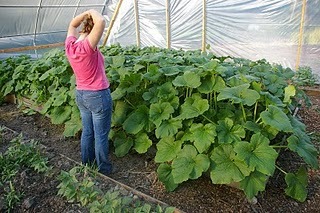 In fact, I'm not sure that the hoophouse has an off season; there's something going on in it all year. I use a tractor, because tilling the soil is backbreaking work, and I can do in an hour what might take me a week to do by hand. I think sometimes about what it would take to farm if my tractor went away, and the simple answer is a lot more hands. There's a reason that farm families were large, and our history is full of examples of group cooperation in agriculture - barn raising, for instance, or corn shucking. Monotonous work is made more interesting when you mix in the social aspect. In fact, I think that modern farmers are more isolated than they have ever been in the past; and some farmers list that as the biggest downside to farming -- the isolation. Maybe we need a matchmaker site for outings to the local community canning kitchen -- if you have one... or a shared chore day. Most people say that they want to escape the rat race and be out with nature, and that is enjoyable. But we are social beings, and that interaction makes it so much better. On my farm I have people contact every day; mostly buyers who come to the farm gate, but suppliers and employees too, and it makes an interesting mix. But I will admit to my antisocial days, when I feel like working with my hands and accomplishing something, and I secretly hope that no one shows up. Tractor time. Fencing time. My time. *The Mayans writing isn't anything that is easily translated to ours, and you'll often find that even the names of relatively famous people have many variations in spelling, and pronunciation. So excuse me if I didn't use the spelling you prefer for this word, ok? I'm not the only pig farm, but I'm certainly one of the biggest in my county. Now that's not saying much; in Iowa I'd be a hobby, but my little 300 pig herd is big in western Washington. ...or melts their brains. I really don't like being the guy who buys all of the hog feed that they've produced for that week. It finally got so bad that I switched mills, as they had constant, reoccurring problem with not being able to have feed on hand. So in order to do what I'm doing is just a little bit harder than it would be if I were in a place where more pigs were raised commercially. I do get asked why I'm not in eastern Washington, usually couched in "they like agriculture over there!" and from the regulatory stuff that I go through, I'd have to say that it's an attractive thought. A month or so ago I had a problem with loose stools in a set of piglets, and did what I could to take care of it; clean water, dry bedding... nothing. So I did something that I almost never do: I found a vet who would see my pigs, and I called them and scheduled a farm visit. I spent $900, all said, on tests and treatments, in the hopes of finding out what the problem was. I rationalized it by saying that I had a lot of pigs, and that if I could find the cause I could then take some sort of action to remedy the situation. All the tests came back negative. No bacteria. No virus. Nothing. So I called the vet last week with a couple more things to check; and got a call back today. Well, I guess 5 days for a return call is probably acceptable. Tomorrow morning I'm going to call my local agricultural extension office and ask them about having tests done directly. There's a certain minimum amount of business that needs to be done to support the basic infrastructure for a farm. It's a little like endangered species breeding population. Having dropped below that number, it's going to be very hard for people to do that sort of farming in that area unless they're pretty darn dedicated. A goal of mine when I started farming was to get to the point where I ate only meat that I raised; and this has taken me in a couple of different directions. Tonights struggle was with our american love of easy to eat foods. There are days when I don't want to cook, when it's just easier to pull a can out of the pantry and heat and eat; one of my staples is canned chile, and it's just time to break that habit. Add the tomato paste and stir in. Add the beer, watching the consistency of the mix. You want it a little thick; keep adding until it looks like you think it should. like it. A pinch of salt to finish it. If you'd like a variation, you could add a couple of teaspoons of sugar and see what that tastes like. Stir in the kidney beans, warm them, and serve. So when I cook this, I'll cook a batch that is 8x bigger than what I've listed above -- couple of gallons of it -- and I'll pressure can it into 1 pint jars, roughly the same size as a canned chile. And like magic, I've got my easy-to-eat food. I'm not sure what's going on, but this blog has now had 500,000 visitors since i started it. The traffic is interesting; it's increasing rapidly as time goes by; roughly 10% of all visitors ever were last month; which means, at this rate, we'll surpass 1,000,000 visitors by this time next year. We are over 1,000 visitors a day; some days approach 2,000. My writing is aimed mostly at the nuts-and-bolts aspects of small farming, and the audience I write for is other producers, but apparently that's been a popular topic for other groups as well. Anyways, I'm glad that you stopped by, and I hope you find something that interests you.